Your cooler is one of the most important parts of your camping gear. If you don’t have good food, you won’t last very long. Before you prepare for your next camping trip, make sure you take a look at this guide and learn all there is to know about top coolers. Not all coolers are made the same. Though there are a lot of different kinds of coolers out there, not all of them are suited for camping trips. You’ll want to make sure the top coolers you choose will actually keep your food at the right temperature before driving away from home. 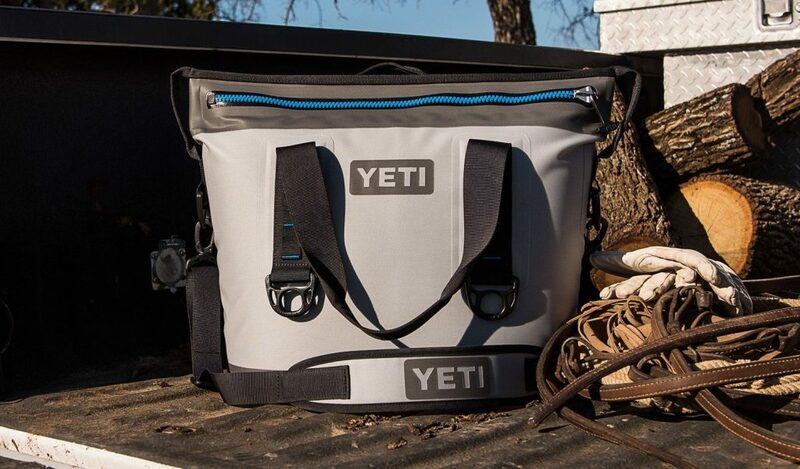 These are not the best camping coolers unless you’re talking about the expensive Yeti variety. Most soft coolers are made of fabric, and they aren’t designed to keep food cool for more than one day. If all you need a cooler for is a day at the beach every once in a while, soft coolers will do fine. Any trip longer than that needs a better cooler. This kind of cooler isn’t practical for campsites either (unless your campsite miraculously has an outlet). Electric coolers are more like little refrigerators. They plug into the wall, or in some cases the car, and keep your food cool with electricity by maintaining a vacuum in the internal space. Because you don’t have to fill it with ice or drain it, this kind of cooler can remove a lot of hassle from your trip. The walls of these don’t tend to be a thick and therefore ice retention isn’t quite as good. If you’re staying at a hotel and want to bring your own food along or have a long drive ahead of your, this cooler is a good choice. The plastic makes these coolers durable, so they can take a good amount of roughing up and still last for years. If you’re planning a multiple day getaway, a plastic cooler is a cooler you’ll want and better brands can keep ice for up to 10 days. So unless you’re going on an intense camping trip that will include a lot of meat, you should probably stick to a plastic cooler. Traditional coolers are the coolers you see lining store shelves. 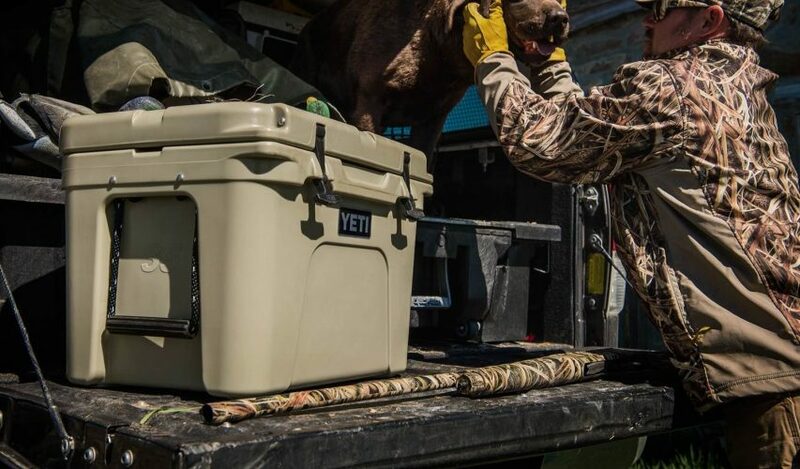 Unless you’re planning on some heavy-duty camping trips, this is probably the kind of cooler you’ll want. How Cold Should I Keep My Cooler? This depends on what you’re keeping in your cooler, but according to the U.S. Department of Health and Human Services, all perishable food should be stored at or below 40 degrees Fahrenheit. This temperature is important because your food could spoil if it gets too warm. But your food can make you sick long before it starts to smell bad, so if you’ve stored it at the wrong temperature, you might not even be able to tell it is bad. You don’t want to risk getting sick when you’re camping. The nearest hospital could be hours away, and it will ruin your vacation. Traditional coolers can reliably keep food at this temperature for four to five days. If you’re planning a longer trip, you’ll want a high-end cooler. Now, you do have a bit of leeway here. A lot of campers like to enjoy a beer around the campfire at the end of the day, and the best beers are served cold. Beers should be kept at around 40 degrees Fahrenheit as well, but they don’t have to be that cold. If you’re using your cooler for beers or cold drinks, the temperature doesn’t have to be as specific. What Size Should My Cooler Be? To figure out how big your cooler should be, you first have to know how many people will be using it and what you’ll be using it for. If you’re camping trip just be you and one other, you won’t need anything larger than a 40 to 50-quart cooler. This will last you a weekend. A 70-quart cooler will last two people longer than a weekend or can sustain a family for a weekend. Any coolers bigger than that are for large crowds. They are heavy and can be difficult to move, so you may want to stick to smaller coolers. You can always mix and match coolers. Maybe you’re planning a family trip but don’t want to deal with a large cooler. You can get two or three smaller coolers instead that are easier to move. Or you may be able to downsize your food cooler if you decide to have a separate cooler for your drinks. 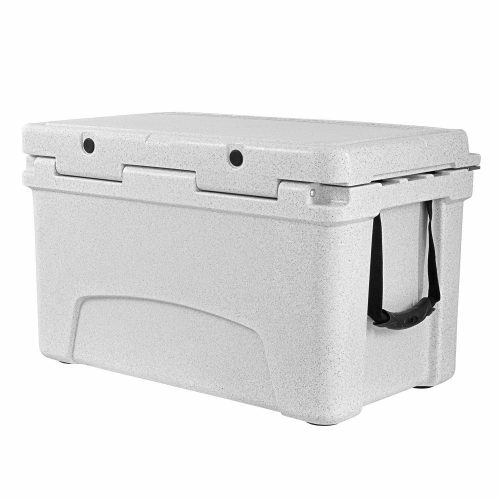 Keep in mind, the external size of a cooler is different than the internal size. Make sure you look at the external size too. You may end up with a cooler that doesn’t quite fit in the back of your car or one that can’t store enough. Different coolers come with different features, but there are a few things all top coolers should have. These should be at the bottom of the cooler. A draining hole higher up on the cooler will require you to tilt the entire cooler to drain the melted ice. For bigger coolers especially, that simply isn’t an option. Make sure the hole isn’t so big ice cubes will drain out as well. Some brands, like Grizzly or Igloo Yukon coolers, have large holes that are supposed to speed up the draining process. Just undoing them slightly and letting them drain will avoid losing all your ice too. 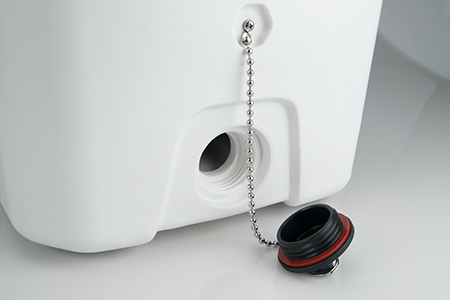 You should also look for top coolers that connect the drain plug to the cooler by a chain or lanyard, again the Yukon brand is good for this. If you lose that plug, your food and drink could be spoiled. 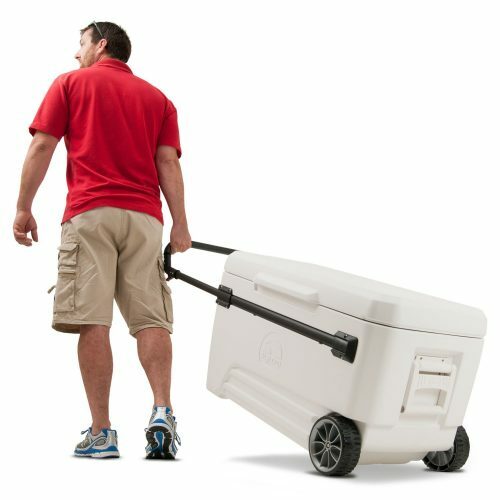 Most large coolers have to be carried by two people, especially if they are full. If you’re going to be handling a large cooler on your own, wheels and handles could really help you out. But they aren’t entirely necessary. You can drag a cooler without wheels, but the bottom will get scratched and damaged over time. Wheels just make it drag a little easier and protect the bottom from rocks and sticks. If you’re dealing with a 100-quart cooler, you may need to drag it more than you carry it. However, because it is so large and can get so heavy, you may be better off putting it in the car at the beginning of your trip, packing it once it’s inside, and leaving it inside for the rest of the trip. You may even be able to leave it in a wagon. Both options will make it harder to drain, but it could save you a lot of moving trouble. Though not necessary, this can help you keep your drinks organized and upright. It may not be of much use if your cooler isn’t in the communal gathering area (you won’t want it near the campfire or any other heat). But, this could be a nice feature if you have a large party and a lot of drinks. A cooler is only helpful if you know how to pack your food and take care of it at the campsite. Here is a very quick crash course. The bottom of the cooler is colder than the top of the cooler because that is where all the ice water melts. Therefore, make sure you most perishable foods (like meats) are at the bottom of the cooler. The sun will only make even top coolers warm up faster. If you want your food to stay cool, put your cooler in the shade. Leaving a bit of ice water at the bottom of your cooler will keep it colder longer. Putting warm food on ice will melt the ice, if only slightly, before it gets a chance to warm up. Put all your food in the refrigerator before you pack it. Top coolers work best when they aren’t messed with. Every time open the cooler, you release a lot of cold air. Of course, you have to open your cooler, but try to keep it closed tight as much as possible. If you don’t have good coolers, you won’t have good food. When you’re looking for a cooler, make sure they’ll keep your food at 40 degrees or below and support the entire camping group.